Are you playing live in London? Hey all! Had a few bites on my earlier post, but haven’t been able to make dates work. So still on the hunt for someone working in lush(ish) ambient/drone stuff - noisy is cool as long as audience can still drift off a bit as that’s the point of the gig. Date is March 14th. If you’re in or around London and available, drop me a note! While on board The Golden Hinde artists will collectively interbreed two species: noise music and classical music. How can a classical instrument be noise? Find out by watching three different noise classical crossover projects within the heart of a ship drenched in history and mystery. For those of you already familiar with noise we will add to your already well developed misconceptions, and for those of you who are less familiar with noise we may surprise you with where the music travels. With experimentation at the heart of the music, the artists performs music as a gesture, the essence of live performance. The ship itself is seeping with memory, making it the noise-perfect host for this cross over to take place. Artists will bring together the cello, violin, flute and a choir in one evening. We will welcome sound waves resonating creatures of the sea, wood spirits and nautical murder ballads on this very special evening on board The Golden Hinde. 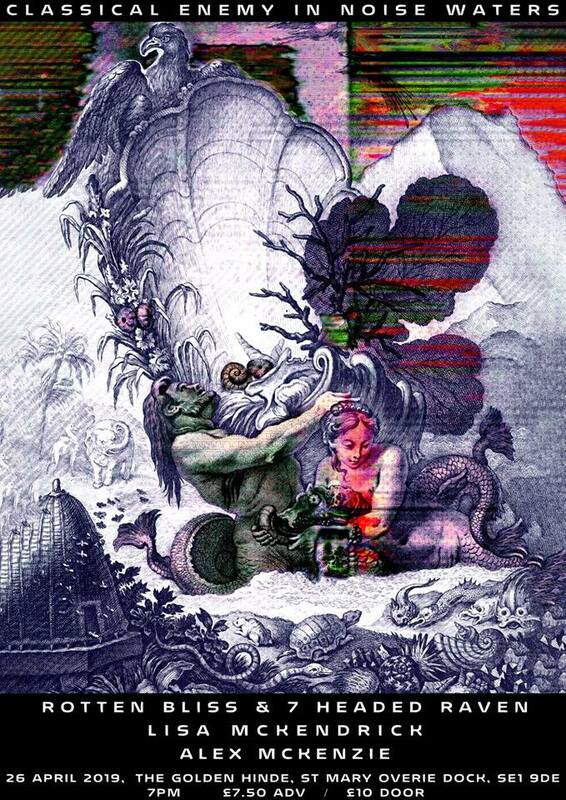 FAIR ISLE is a special collaboration between noise cellist Rotten Bliss and international folk choir 7 Headed Raven. Created especially to haunt The Golden Hinde, FAIR ISLE is inspired by our enduring fascination with the sea in art and folklore and draws from 16th century poetry, nautical murder ballads, and ship diaries, told through fragile and beautiful vocal harmonies, panoramic cello drones, and electronics. Alex’s work evokes a landscape of sound using the flute and electronics. The flute will echo the wooden quality of the ship in a concoction of resonating wood spirits and electronic sound waves. Alex’s performances are semi-improvised using a mix of analog and digital electronics alongside the flute. Lisa will deliver a violin noise piece which is improvised using the violin and a series of effects, loops and vocals. The performance evokes an interaction between noise elements in the live electronic set up, vocals and violin sounds. By listening to the sounds of the instrument interacting with live effects this noise becomes the second instrument. Utilising this interaction she will build textured layers of sound and deep echoing violin; conjuring mythical creatures of the sea. Expect elements of a witch-craftian and song-craftian nature. Dark brooding dronescapes combined with analog and digital sound sources, including field recordings, detuned radios, analogue televisions, computers, turntables, CD & mp3 players, tape recorders, 8-bit gameboys, handmade electronic devices, broken vintage equipment and handmade sculptural instruments. Bernhard Living (b. 1948) is an experimental music composer, curator and former multi-instrumentalist (playing alto saxophone, bass clarinet and flute). He was born in Ely, Cambridgeshire, England – and lives and works in London and Southampton, England. He studied composition with the South African-born composer professor Stanley Glasser at Goldsmiths College, University of London, and philosophy under professors Jonathan Reé and Peter Dews at Middlesex University, London. 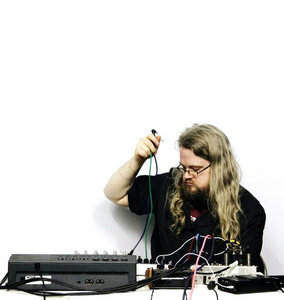 Bernhard Living’s digitally-based compositions have taken minimalistic compositional techniques to what he considers to be their logical conclusion, with his music being characterised by sparse textures, long periods of silence, maximal repetition and minimal variation. The compositions are often devoid of musical elements such as melody, harmony and rhythm, and as an alternative they explore the use of sound colour and sonic textures. Collaboration between visual/electronic artist and musician Lisa McKendrick (Listen Lisse) and animator and electronic artist Tim Drage (Cementimental). 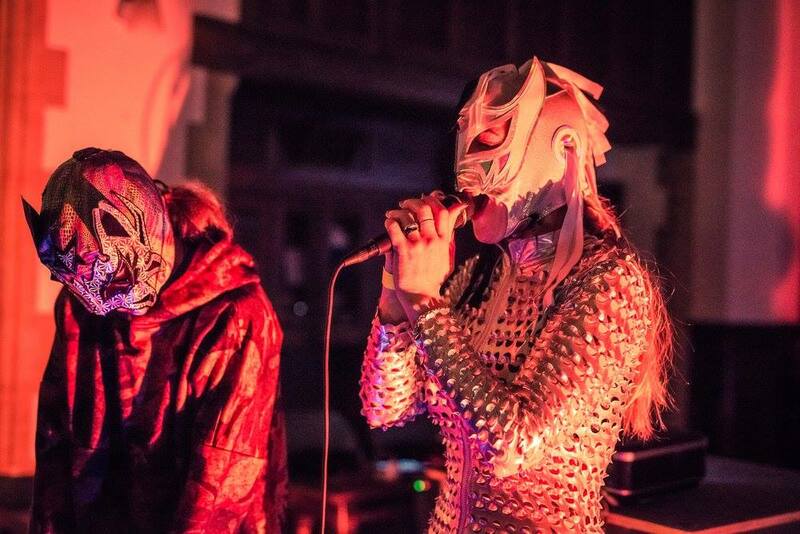 The duo perform with live video projections and illuminated props, and also with their self-built synths, noise boxes, circuit bent toys and vocals. The group was formed by a group of people interested in exploring the possibilities of live electronic music and collective improvisation. The groups aim is to unify and integrate many diverse sound elements. Other electronic instruments include a 4 speed portable reel to reel tape recorder. LONDON Fort Processor workshop. 1st June, at IKLECTIC, Old Paradise Yard, 20 Carlisle Ln London SE1 7LG - right near Waterloo station. The workshop runs from 11am for about 3 hours, and is suitable for complete beginners to soldering as well as more experienced synth builders/circuitbenders.